The Triumph Trophy is a motorcycle produced by Triumph from 1997 to 1999. The Trophy's origins lay in the International Six Day Trials of 1948, when, with a new 3T based trials machine almost ready for production, Triumph decided to enter the event to be held at San Remo, Italy. The 350cc twin was not considered to be sufficient for the task and as a consequence three Triumph Speed Twins were modified. Despite winning one of only two manufacturers awards made it was felt that the machines were too unwieldy in the form that they had competed in. On the other side of the Atlantic "enduro" events were rapidly increasing in popularity resulting in the decision to produce a machine suitable for ISDT events that could also be marketed in the States, that combined the best features of the now still born 3T derived trials bike and the "works" Speed Twin based ISDT machines. The result was the TR5 introduced during 1949 which quickly established an enviable reputation in long distance, off road events. The Trophy mirrored the developments incorporated in the road range adopting a pivoted fork frame in 1955 and was joined by a 650cc variant, the TR6, in 1956. Unit construction for the engine and gearbox was adopted for the 1963 season. 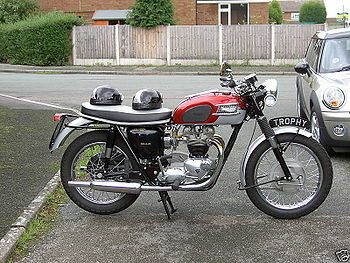 By the mid sixties the Trophy's built for the British market were becoming increasingly orientated towards the road, with low exhaust systems and normal tyres, effectively becoming single carburetor versions of the Bonneville, whereas those offered for the US markets retained the off road bias. This page was last edited on 21 January 2011, at 17:06.